When the murder weapon is revealed as one of the wooden stakes used to identify trees on the farm, Sheriff Evan Grey turns to Holly’s father, Bud, and the Reindeer Games staff. And it doesn’t help that Bud and the reindeer keeper were each seen arguing with Margaret just before her death. 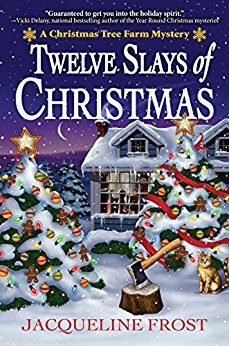 But Holly knows her father, and is determined to exonerate him.The jingle bells are ringing, the clock is ticking, and if Holly doesn’t watch out, she’ll end up on Santa’s naughty list in Twelve Slays of Christmas , Jacqueline Frost’s jolly series debut. This is a terrific holiday mystery. Fix yourself a cup of hot chocolate, grab some frosted sugar cookies, and curl up in your favorite cozy spot and enjoy! I sure did! Food, Christmas, and a MC who is figuring out where she wants to be in life? This sounds like the perfect for me – especially with a murder! Sounds like a interesting book!